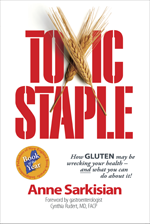 Thousands of significant research studies from around the globe exist on the hazards of gluten consumption, but this vital information, much of it found in Toxic Staple, is not reaching mainstream medicine at anything beyond a snail’s pace even ten years after the NIH Consensus Conference on Celiac Disease in 2004. That’s why you must become your own advocate in maximizing your health. Slowly, most gastroenterologists are finally recognizing celiac disease (CD), but there is still huge unawareness among mainstream medicine as to the symptoms and serious, degenerative, life threatening ailments linked to gluten whether it’s celiac disease or gluten intolerance. I am amazed, as I go about life, how many people with gastrointestinal issues are never offered testing to track down a sensitivity to gluten. And too often, if they are tested, only one test is given. It may be negative and they are told they don’t have a problem with gluten. And gastrointestinal symptoms and maladies are only a small part of the picture. Since gluten can affect ANY part of the body it is imperative that doctors in all facets of medicine be educated on its insidiously destructive effects. But who is educating our doctors and healthcare practitioners on this crucial malabsorption/immune reactive issue? Many patients have had “every test in the book” except the right ones. It seems that testing for celiac disease or gluten intolerance is the last of the tests to be offered, if at all. They should be the first line of defense since so many ailments clear up when gluten sensitivity is detected and the nasty protein is removed with a gluten-free diet.